WAIST HIGH: Happy 25th Birthday Business As Usual. Happy 25th Birthday Business As Usual. 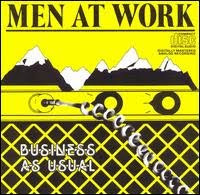 The debut album from Men at Work gave the band the position of being the only Australian artists to reach #1 in the album and singles charts in both the United States and the UK with Business as Usual and "Down Under" respectively. "Who Can It Be Now" also hit #1 in the USA in October of 1982.
Business as Usual toppled the record for a debut album for most weeks at #1, originally set by The Monkees, staying at the top of the charts for 15 weeks. The album would also help the band become Grammy winners for Best New Group in 1982.